In partnership with international relief agency CARE, an inspiring look at how women around the world are developing businesses and creating opportunity. 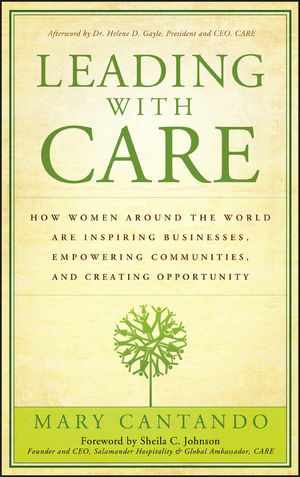 In this ground-breaking business book, management expert Mary Cantando examines the stories of women in the developing world who, with help from the non-profit organization CARE, have capitalized on personal and professional opportunities, contributed to their communities, influenced their physical environment, and overcome discrimination on the road to establishing self-sufficiency and building strong lives and strong businesses Structured around these five principles CARE's mission statement, Leading with Care expertly bridges inspiring stories of human endeavor with straight-up business lessons that all of us can apply to our work and organizations. Featuring interviews with top female executives at American companies who devote their own time and resources to CARE, we see just how much we can learn when it comes to growth, opportunity, and community. Each section ends with a discussion and specific questions that will help you integrate the lessons in your own life. In an ever-shifting world, CARE's message is timeless. Its practical approach to building businesses and self-sufficiency, in any economy, in any nation, gives us all hope and the power to create our own secure futures. MARY CANTANDO is the founder and growth expert of WomanBusinessOwner.com, an organization that helps women start and grow businesses. As an envoy of the U.S. State Department, she has traveled to developing countries to speak to women about starting and growing their businesses. She is a chapter chair of the Women Presidents' Organization and a leading member of Women Impacting Public Policy and the Women's Business Enterprise National Council.